The Innokin iSub APEX Top-fill Dual Adjustable Airflow Tank is a new member of Innokin. It equipped with 3ml e-juice capacity and 22mm diameter. It features huge clouds and good flavor. Innokin iSub APEX Top-fill Dual Adjustable Airflow Tank Kit - 3ml, features consistent full flavors and huge clouds. The spin top fill system help you refill quickly and cleanly. Adjust airflow ring is raised to minimize leaking and maximize performance. Compatible with iSub coils. Air is drawn in the patented Prism convection airflow system through the dual, raised, adjustable intakes, down into the heated outer chamber and then back up through the vaporizer coils, delivering maximum flavor and also minimizing leakage. turn the top section open; carefully add e-liquid into either hole. Do not overfill; Turn the top section to close. Important: Prime coils by adding 3 - 5 drops of e-liquid into the center. unscrew the bottom metal cap of the iSubx APEX while tank is upside down; hold the coil and gently pull to remove; pick a new coil, align the flat sides of the new coil; push to insert new coil firmly into tank; carefully and firmly tighten the metal cap. Notice: this unit may include small parts. Keep out of the reach of children. 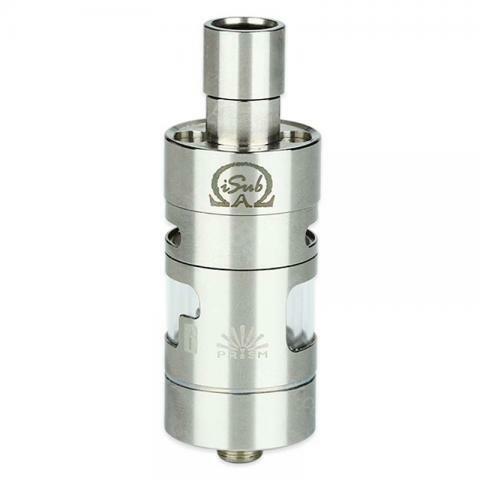 Innokin iSub is a top fill tank with adjustable airflow. I like it so much. Innokin iSub APEX ist ein gutes Modell für Einsteiger. Sie ist mit ein paar einfachen Handgriffen und knüpfen sehr einfach zu bedienen. The order reached after two weeks, the product is original, the equipment is very rich. Good flavors and huge clouds,and the design is very beautiful, I like it very much.